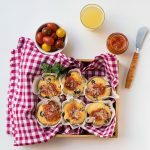 Quick and easy muffins with cheese, ham and pizza sauce. Made only with a bowl and a fork! I’m writing this post and my keyboard is full of crumbs! 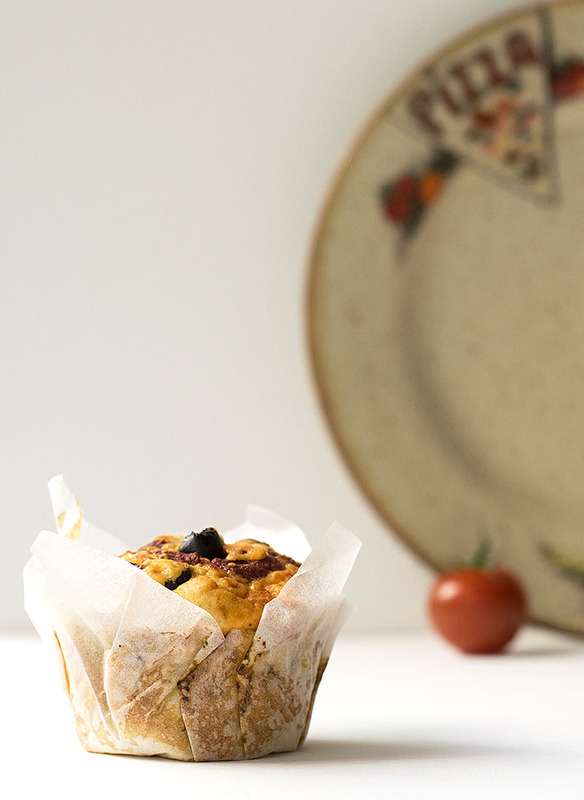 (So you know, I’m actually really neat and tidy but these muffins bring out my gluttony self). It’s a good thing I don’t have to talk to you, because all you’d be able to hear would be some ramblings between my chewing sounds ( again, I usually don’t talk with my mouth full…). This is my third muffin so far and I can’t keep my hands off of them. They’re becoming a problem. A good one. The first time I made these was at a brunch, along with my favorite smoothie and a lemon coconut olive oil cake, and everyone was obsessed with them! 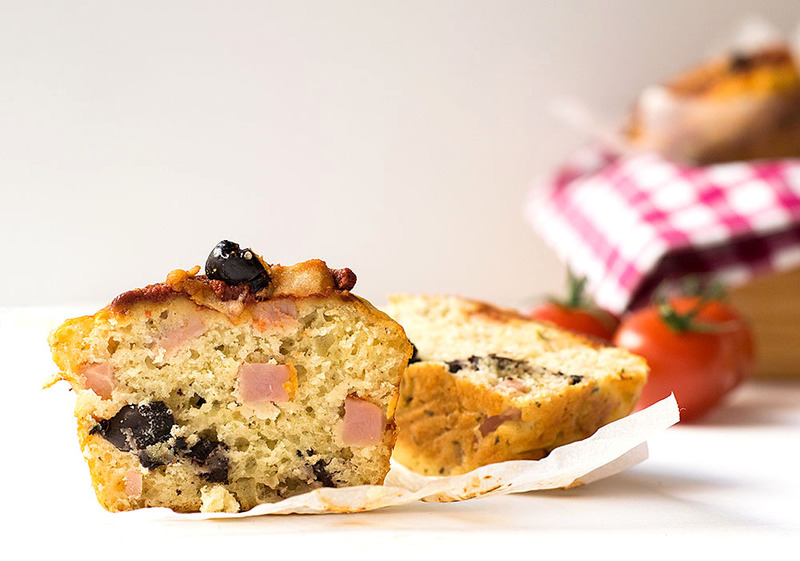 The fluffiest muffin you have ever eaten with a melt-in-your mouth crumb. A cheesy, CHEESY, flavor that hits your taste buds from the moment you put it in your mouth. No wait, that’s wrong. You get that cheesiness a lot sooner, by just smelling them. A warm meaty flavor from the ham. A saltiness from the olives. A fresh taste from the tomato sauce. A hint of fruity olive oil to wrap things up. Aside everything else, these muffins are super cute and adorable. I mean, look at them. How can you not love them? They’re perfect as an appetizer if you want to feed a lot of people and no one will complain. They’re crowd pleasers I tell you! To achieve a nice presentation, I skipped the usual muffin liners and cut some baking paper into 5-inch squares. With a glass the same size as my muffin tin holes, I pressed the paper squares firmly to fit in the holes. My papers didn’t want to stay in their place, so after giving them their shape I had to hold them with my one hand while I filled them with an ice cream scoop I was holding with my other hand. It will be a lot easier if you have some help! Or you can always use regular liners. 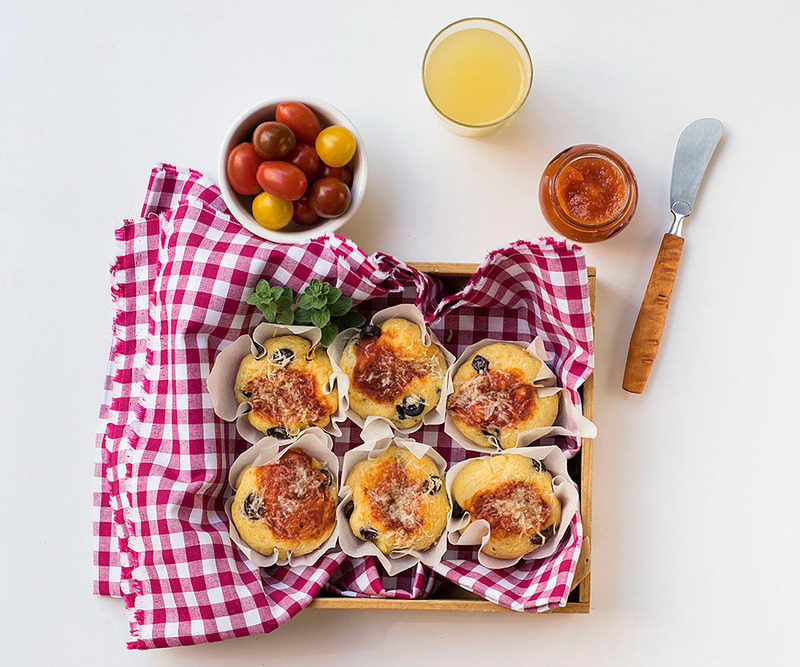 Serve plain, as an appetizer with some green salad or with some rose geranium tomato marmalade. 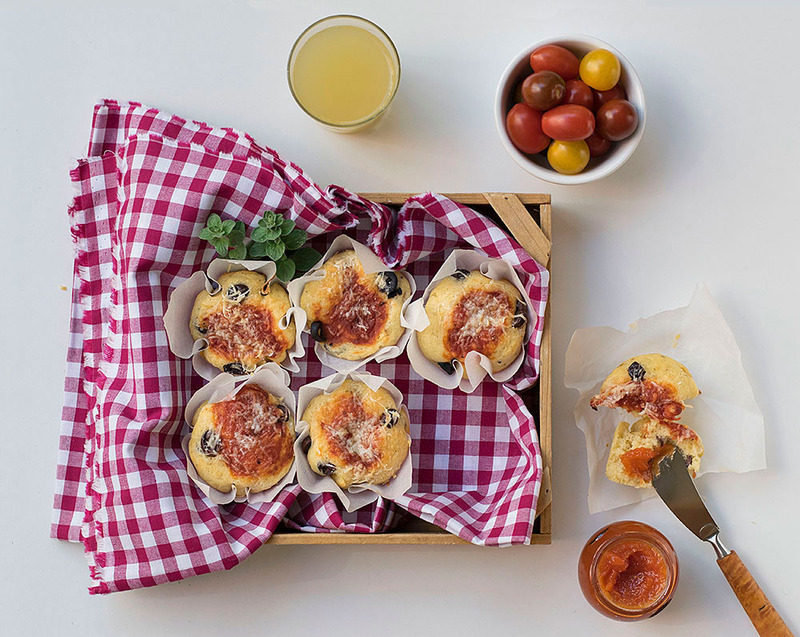 Quick, easy muffins with cheese, bacon and pizza sauce. Made only with a bowl and a fork! In a bowl mix the 9 first ingredients (the dry ones). In another bowl mix all the liquids and add them to the dry ingredients. Stir with a fork until almost combined. Add the cheese, ham and olives and stir gently. Don’t overmix. Wet a spoon and flatten their surface a little. 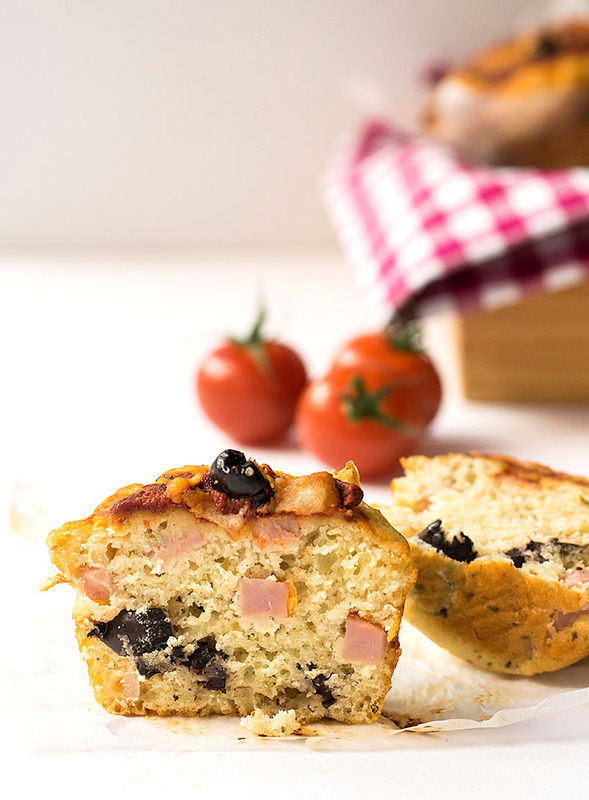 Top with a teaspoon of tomato sauce, a sprinkle of parmesan, oregano and olives. Bake for 25-30 minutes or until a skewer inserted in the middle comes out clean. Leave on a rack to cool. Eat. These sound delicious! And your writing style is adorable. I would totally eat these for dinner with a big green salad. Thank you for your kind words Brianna !!! Just finished making these for dinner and they were so delicious! I thought my daughter was going to make herself sick, she ate so many! Thanks for a great recipe! Thank you very much Erica!